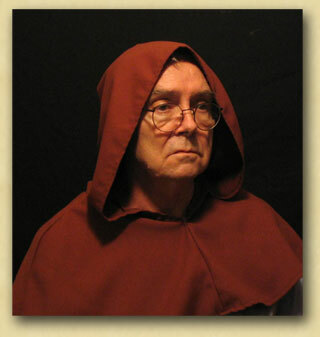 By way of an introduction, DeNomolos is a somewhat elderly gentleman who is a retired educator. A collector of the unusual, a student of the black arts and a bizarrist by choice, he entertains a group of friends on a regular basis in his spacious home, which he describes as a wizard’s keep. In his library is a collection of magical tomes, esoteric writings, scrolls and clay tablets from which he does his constant research into the unknown. Boxes of every shape and description fill any empty shelf spaces and display cases hold wonders, which only the Master of the Keep could describe. To say that DeNomolos is an eccentric is an understatement. His knowledge, while humble, is all embracing and he will debate at the drop of a subject. As Devils advocate and protagonist, he can overwhelm you with verbiage, which, I suspect, is probably his only real vice. His magical stories entertain and elucidate at the same time but He does however, tends to ramble and is often so caught up in his dissertations that he doesn't notice his guests nodding off. It has been my privilege to be included in these evening activities and I have taken it upon myself to describe the proceedings as best I can. The material herein, was collected over several years and the body of the work is that of DeNomolos. In truth, some of this material is duplicated in his other writings. The Egyptian aspect is probably his forte and he will explain why in his introduction. Armed now with this information, you may now begin to delve into the remarkably strange world of DeNomolos. Read now as he explains. In the late thirties and early forties, I sat in darkened movie theaters and watched the “B” grade horror movies that provided escape from the realities of the end of the great depression and the early stages of World War Two. Highly impressionable, the movies like the “Mummy” and the “Return of the Mummy” and “Abbott and Costello meet the MUMMY” stirred something deep inside of me and I decided that I would become an Egyptologist. The whole bottom shelf of my grandfather’s library consisted of the National Geographic Magazine dating back to the very first issue and I absorbed every bit of information I could find about Egypt and the Pyramids. The public library was my next challenge. Primarily it was just getting past the librarian who sat at the front desk by the entrance like a big guard dog and barked at the children if they even thought about going into the reference section. Archeology and Sociology were not acceptable for young people. We were expected to read the Hardy Boy Mysteries and things like that. My tastes ran to the works of Edgar Alan Poe and Lovecraft until I discovered E.A.Wallis Budge. His books on Egyptian civilization became my constant companions and opened the doors to what became a life long fascination with things Egyptian. It was understood that the roots of most, if not all of the Western concepts of basic magic, could be traced back to the rites and practices of ancient Egypt. No one knows where these practices began but the records identify wizard priests back in the fourth Dynasty. Egyptian magic was a part of their religion and practitioners taught that all-natural and supernatural force were gifts from the gods. The magic was in the action to be sure, but more important were the words, the names of things, the spoken rites and rituals. Now you know and perhaps understand my fascination with things Egyptian.